Smoky Mountain MineralsToday’s Save:$16 for a mineral makeup kit from Smoky Mountain Minerals, plus free shipping! Hematite Eye Bracelet for only $6.99! Turtle Magazine Subscription for over half off! Great Deal at Best Buy! Barnes & Noble NOOK Color eReader, Just $199.99; or NOOK Simple Touch Reader, Just $99.99. Check Out Walmart’s Cyber Week Specials! Extra 40% off Outerwear for Her Plus Free Shipping at SmartBargains.com! Savings at Soap.com Earn up to 3.3% Cash Back! Savings at Target.com Earn up to 2.1% Cash Back! Discounts from Sears Outlet Earn up to 0.9% Cash Back! Pay $10, and wrap up a customized care package from St. Nick’s workshop including a personal letter from the man in red, a certificate authenticating your kid’s spot on the Nice List, and a special wish list that’ll whisk any holiday hankerings straight to Santa’s desk (a $20 value). 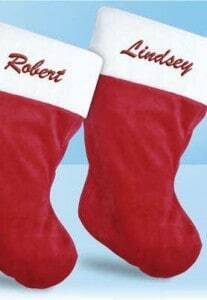 Pay $6 for a custom-embroidered stocking from Vistaprint (regularly $14.99), and get 30% off all other Vistaprint items and free shipping when you spend an additional $25.